The Wintermyer Auto Salvage Sprint Showdown presented by Rock-It Pizza brought closed the curtain on the 2016 Susquehanna Speedway. And it brought a little of everything. Hanover’s Jacob Allen gave the largest crowd of the season a thrill has he led all 30-laps to capture his first career 410 Sprint car win. Allen’s win came in the final BAPS Coatings & Supplies race of 2016. After winning the dash, Allen, who recently completed his third full season on the World of Outlaws tour lined up on the pole and would keep Lance Dewease at bay during the entire 30 lap distance as he became the fourth different winner in five BAPS events this season. With Delaware style restarts the theme for the day, Allen was able to stay out front and was never seriously challenged as he brought home the big $5,000 check for the Shark Racing Team, owned by his father, Bobby Allen. Allen controlled the event as only one caution slowed the pace during the first 21 laps. But two straight reds, one for Kyle Reinhardt and then another for Logan Wagner on the restart slowed the pace. The third and final red came out with four laps to go when Tyler Reeser flipped. Second-starting Dewease finished second with Greg Hodnett winning the torried battle for third over Brent Marks. Fifth went to Ryan Smith, who earned $500 from Emory Transmissions and a $400 gift certificate from Brown & Miller Racing Solutions for setting fast time. Completing the top ten finishers were Freddie Rahmer, Hard Charger Brandon Rahmer, Glenn Forsythe, Caleb Armstrong and Mike Mahaney. Rahmer earned a $400 gift certificate from Brown & Miller Racing Solutions. 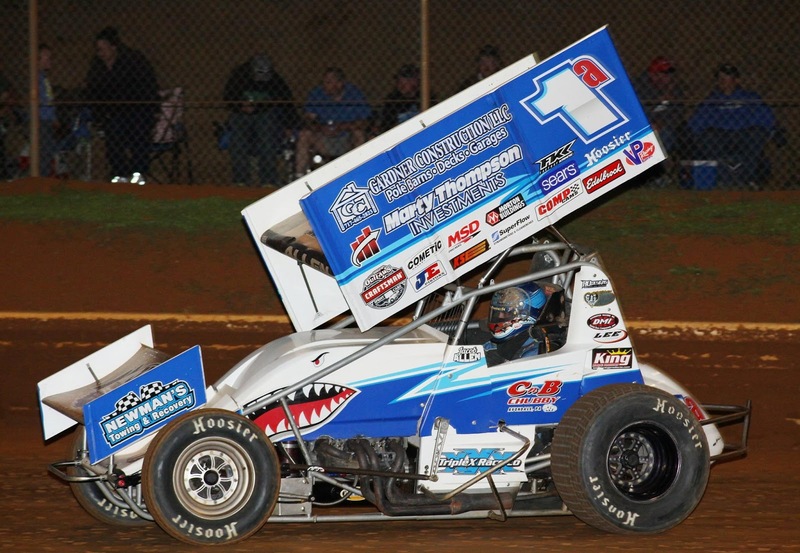 Smith’s fast lap of 14.918 seconds during time trials came over a field of 35 410 Sprints. Heats were won by Kyle Reinhardt, Allen, Dewease and Wagner with Brandon Rahmer taking the consolation win. Kevin Nouse started second in the 25-lap 358 Sprint car feature and led flag to flag to score the $1,000 payday. Numerous yellows slowed Nouse’s pace and a close call when Shane Yost spun directly in front of him with 22 laps complete, but it was all Nouse out front in taking the win over sixth-starting Steve Owings, 14th starter Kyle Denmyer, 10th starting Brie Hershey and 18th starting Cody Flecher. Rounding out the top ten finishers were Dwight Leppo, Steven Drevicki, Todd Gracey, Jeff Halligan and Jordan Givler. Heats for the 24 358 Sprints were won by Nouse, Doug Hammaker and Drevecki. The 2016 awards banquet is up next for Susquehanna Speedway and it will be held on Saturday, December 17th at the Wyndham Gettysburg. The deadline to register is December 2nd. Tickets are $50 per person. Cocktail hour begins at 5pm with the banquet beginning at 6pm. The Colt Wilbur Band will be the featured entertainment. BAPS COATINGS & SUPPLIES 410 SPRINTS WINTERMYER AUTO SALVAGE SPRINT SHOWNDOWN: (30 LAPS)-1. Jacob Allen, 2. Lance Dewease, 3. Greg Hodnett, 4. Brent Marks, 5. Ryan Smith, 6. Freddie Rahmer, 7. Brandon Rahmer, 8. Glenndon Forsythe, 9. Caleb Armstrong, 10. Mike Mahaney, 11. Chase Dietz, 12. Chad Trout, 13. Tim Glatfelter, 14. Curt Stroup, 15. Tyler Reeser, 16. Kyle Pruitt, 17. Kody Lehman, 18. Logan Wagner, 19. Tyler Ross, 20. Brian Montieth, 21. Kyle Reinhardt, 22. Wayne Dadetto, 23. Logan Schuchart, 24. Anthony Macri. Disqualified: Danny Dietrich (Late to feature lineup gird then refused to go to the rear of the the field: Three other cars were also late to the grid and started as the rear. Did Not Qualify: Brandon Spithaler, Joe Kata, Ryan Linder, Tyler Bear, George Streaker, Jr., Paige Polyak, Dwayne Gutshall, Dustin Baney, Aaron Ott, Steve Buckwalter. 358 SPRINTS (25 LAPS)-1. Kevin Nouse, 2. Steve Owings, 3. Kyle Denmyer, 4. Brie Hershey, 5. Cody Fletcher, 6. Dwight Leppo, 7. Steven Drevecki, 8. Todd Gracey, 9. Jeff Halligan, 10. Jordan Givler, 11. Chris Frank, 12. Phil Walter, 13. Randy Whisler, 14. Trey Hivner, 15. Doug Hammaker, 16. Amy Ott, 17. Nat Tuckey, 18. Nick Palmerino, 19. Shane Yost, 20. Jake Eldreth, 21. Chandler Leiby, 22. Bob Howard, 23. Jon Stewart. Did Not Start: Brent Shearer, Dan Richcreek.